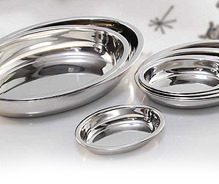 Browse through our wide spectrum of stainless steel serving bowls, which are ideal to serve the dishes in a convenient and fashionable manner. Different outstanding shapes and sparkling charm of these serving bowls add your serving way an exclusive touch. High quality stainless steel lengthens the life of these bowls and makes them ideal for abodes, office canteens, hotels and restaurants. 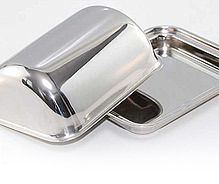 This is an exclusive serving dish made of finest quality stainless steel and is available in different sizes. This is the perfect serving dish as everyone knows that great food looks and tastes better if it's well presented. 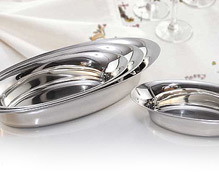 This oval dish with lid has stainless steel construction to keep contents hotter for longer. 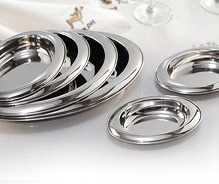 Metal exports offers the best quality stainless steel bowls, which are available in oval shape and different sizes. 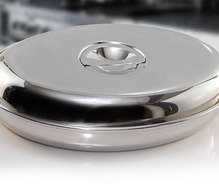 This simple yet elegant butter dish is made from top quality mirror polished stainless steel.